The holiday season is all about giving back to others and your community. If you want to give to RCHS, there are many different ways you can help us. Critter Community Holiday Card. Our annual Critter Community Holiday Card is in the mail. If you have a family member, a friend or a pet that you would like to remember or honor with a donation to the animals at RCHS, you can have this published in our ad in the December 22 edition in the Rutland Herald. You can find this form on our website, our Facebook page, or stop-by the shelter and pick one up. Please mail it back by December 14 to ensure you make the deadline for the Rutland Herald. Click here to donate online. Amazon Smile. 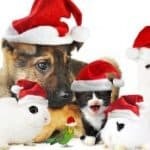 If you are doing your holiday shopping on Amazon, if you use Amazon Smile and choose Rutland County Humane Society as the non-profit, every time you shop, RCHS receives 0.5% of eligible purchases. Click here to learn more. Donations Make Great Gifts! Donations to RCHS in memory or honor of loved ones and friends make terrific holiday gifts. We can send a note or provide you with a note card, whatever works for you! Click here to donate or contact Amelia at 802.483.9171 ext. 208 for more information. RCHS Wish List. You can also shop for the animals at RCHS with our wish list on Amazon Smile, or by picking up items from a local shop. Click here to see our wish list. Pints for Pets Beer. For those beer lovers on your list, we have the Pints for Pets beer that will be available in early December. Spencer Lanning’s Judge’s Choice winning Belgian Stout will make the perfect holiday gift. There are only 30 4-packs available. To see the different gift options (4-pack with the event Pint glasses) and to pledge to buy this delicious beer, click here. Dog Banks. We have dog banks throughout the community in several stores. If you see one by the register, your spare change adds up quickly and we appreciate every penny. Items for Your Pets. We also have a selection of in the package, holiday items for your pet. From reindeer headbands, to cute collars with bells and even cute matching outfits for you and your furry friend. Stop-by to check them out! Adopt a Pet! Of course adopting an animal from RCHS, and giving them a forever home is one of the best ways you can help us. To see our adoptable animals click here. Volunteer! If you are interested in volunteering, we are always looking for extra hands for events, transportation, dog-walking, fostering and more! Click here to learn more about volunteering! We survive off the donations of every kind from our community, and we are so grateful for your continuous generosity. Thank you and have a happy holiday season!